HomeConcourse BlogNever Check Your Luggage Again! Never Check Your Luggage Again! After an exhausting 24 hours and three connections nightmare, the last thing I wanted to be confronted with at my final destination was an empty baggage carousel. When the baggage conveyor belt finally stopped, it was clear that my suitcase was on a vacation of its own. When hope for my suitcase was lost, I did a bit of shopping. I bought two short-sleeved T-shirts, two blouses, a pair of cotton pants, toiletries and a straw hat. Fortunately, my shoes had good tread and were comfortable. Since my suitcase was AWOL for the remainder of the trip, I made do with these items and what I had with me for three and a half weeks. I soon realized how liberating it was not to be encumbered with a lot of extra stuff. Granted I didn’t have much variety, but with a minimum amount of laundering I had clean clothes throughout my trip. When I got home I formulated a system that would allow me to travel carry-on only nearly everywhere for almost any length of time. Since then, I’ve traveled to Papua New Guinea and India. Each trip lasted nearly three weeks and I traveled with your standard rolling 16 x 15 x 8.5 bag and a small camera backpack. I roll my clothes around pairs of shoes in plastic bags. This keeps the clothes relatively unwrinkled and makes them easy to pack. I stick to a color palette, mostly black, white and red. I take as few shoes as I can get away with. I use the bulkiest and heaviest shoes to fly in because they take up the most room. And I always take my full-sized down pillow. In addition, I chose wrinkle-free and fast drying clothes. If pressed I’ll wash things in the room, but laundry services are available almost everywhere. Even modest hotels in such faraway places as India and Thailand frequently offer inexpensive overnight laundry services. I never pack a bathrobe and slippers. Instead I take a pair of heavy socks to keep my feet warm and some sort of light coverup that renders me “decent” enough to answer the door. As far as the three-ounce liquid rule, I buy a few three ounce tubes of toothpaste, transfer liquids into three-ounce plastic travel bottles and take complimentary hotel bottles of shampoo, conditioner and body lotion. I also pare down my cosmetics to an absolute minimum. 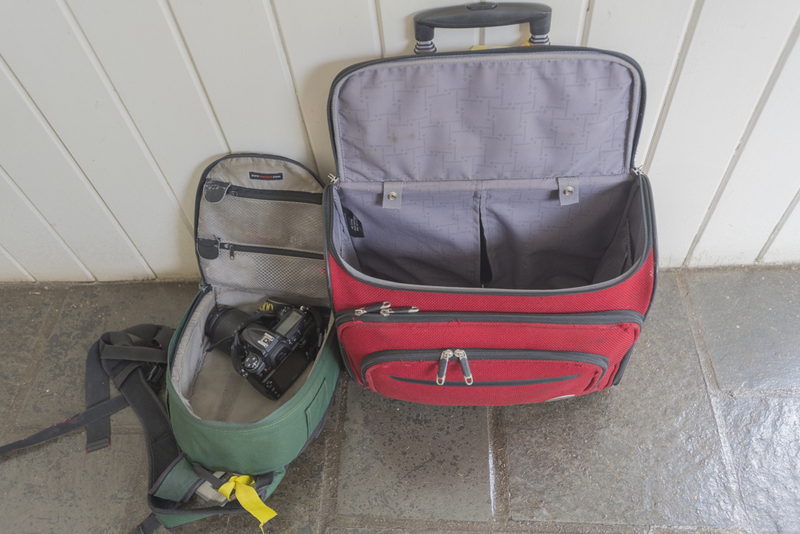 For sure it’s easier to pack light if the weather is warm and dry, but this also works when you’re traveling to a location with inclement weather. I went on a two-week trip to Ireland at the height of the rainy season and I managed to stuff rubber rain boots, waterproof walking shoes, a waterproof jacket, rain pants, thermal underwear, a warm jacket, slacks and shirts into my carry-on. The boots actually don’t take up a lot of space when you consider that I can stuff them with small items. If I truly need something that I didn’t bring and won’t fit in the bag on the trip back, like a heavy coat, or a dress and shoes for an unexpected event, I will pack them up and mail them home. It takes a bit of creativity and some patience, but never checking my luggage has not only saved me money, it’s given me peace of mind. I’m open to improvement. What would you add, subtract? Ellen is a Los Angles based freelance photographer/ writer specializing in travel. Her background in fine art and design gives her a unique graphic perspective.